When it comes to Christmas, one of the things I can't stand are wasteful useless gifts. We all do it...that desperate last minute rush to buy a few extra presents to wrap to go under the tree. You end up paying for over-priced toot that ends up at the charity shop a few weeks later because it wasn't what the kids wanted or needed. The presents I love to give and receive the most are the practical ones. Things that you know will be used and needed. One of my all time favourite Christmas presents was a window cleaning kit from my father-in-law. Every time I clean the windows I think of just how useful and thoughtful that gift truly was. My children love receiving things like new toothbrushes, toothpaste, and flannels in their stockings as part of their Christmas gifts each year. Items that are useful, practical and needed. With practicality in mind, at the top of Miss T's Christmas list this year was a new lunchbox. She started staying one day a week for lunch at preschool this term and until now has been using her big brothers hand-me-down Ben10 lunchbox because I hadn't got around to getting her one of her own. So when Pink Lining got in touch to see what gift item we would like to review for Christmas, I knew we would choose one of their gorgeous PL Child lunchboxes. The 'Raining Cats and Dogs' design is just beautiful with a red gingham-check cat appliqued on the front along with three embroidered flowers. The fabric carry handle has an adjustable clasp- something I've never seen on a lunch box before but a great idea to give a snugger fit for little hands. There are two fabric tabs on the zip which allows the lunch box to open completely (makes for easy cleaning!). Inside a mesh pocket on the opening flap of the lunchbox provides a handy storage area for any small items of food you wish to keep separate. I can see this being a handy place for small pack of raisins or fruit/cereal bars. There is also a name label to stop this lunchbox going astray. The main compartment has an elasticated loop for holding drinks bottles in place. Miss T needs to take a small water bottle to preschool for lunchtimes so this is ideal (although today I have treated her to one of her favourite drinks - an innocent smoothie for kids carton to boost that 5 a day intake of fruit and veg). The lunchbox is thermo-insulated so with a small ice pack popped in should stay cool until lunchtime. The inside of it is wipeable. I have checked the size of this lunchbox and it would fit a yumbox container into it (I have ordered this one for Miss T for Christmas - sshh!). Of course, you can use your own containers as we have done here. We often recycle margarine tubs to hold sandwiches in and drinks bottles are washed thoroughly and re-used as small water bottles. The fabric surrounding the remaining outer of the lunchbox is of course, the raining cats and dogs design showing a very cute grey dog in differing poses, the outline of a startled looking red cat, and some cute blue ducks who I can only assume are there to splash in the (metaphorical) puddles. Some small flowers in different colours complete the design. Just as we took inspiration from Pink Lining's designs when I made a GBBO bake along wedding cake, once again I have taken inspiration from Pink Lining in creating a cute lunch to go into this lunchbox. In fact it was this very print on this lunchbox that has influenced our choice of lunch today. I am no bento lunch expert but I have noticed that by using a few cookie cutters and making lunch fun and interesting my children are more likely to try new foods and eat the food that is in their lunchbox. We happened to have a duck cookie cutter that looks very similar to the pink lining duck so that was used for cutting some bread and cheese slices. We have a puddle of blueberries ready for the ducks to splash into. Our pretty little flowers are made of carrot slices using a cake icing cutter (the same one I used for the majority of my cake design before). The umbrellas are a wholemeal wrap cut into a semi circle and a scotch pancake cut in half. A Lindt chocolate carrot umbrella handle saved from Easter makes the handle and the lines are drawn on with edible marker. 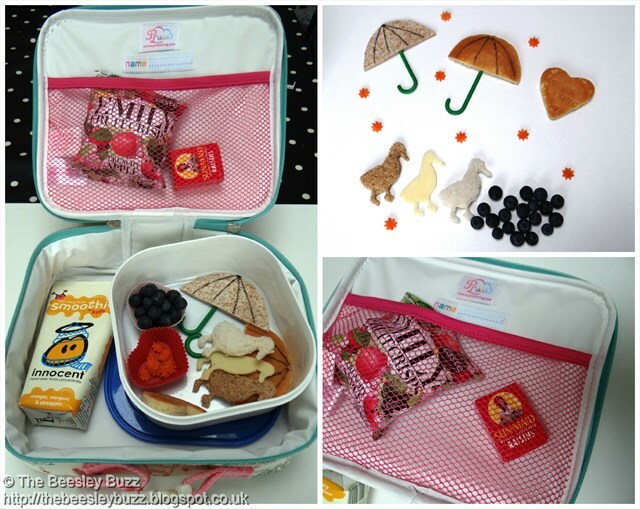 The idea of using the Lindt packaging to make the umbrella handle is one I spotted on Eats Amazing last year in one of my all time favourite bento lunches - an Oliver Jeffer's Lost and Found themed lunch! Today in Miss T's lunchbox we also have a pack of raisins and a pack of Emily's fruit crisps (our favourite is the crunchy apple) tucked into the mesh pocket in the lunchbox. We discovered these at the BBC Good Food show recently and they are such a tasty healthy alternative to actual crisps. Even when it's a 'having lunch at home' day, Miss T often loves having a packed lunch which she takes into her den to eat. 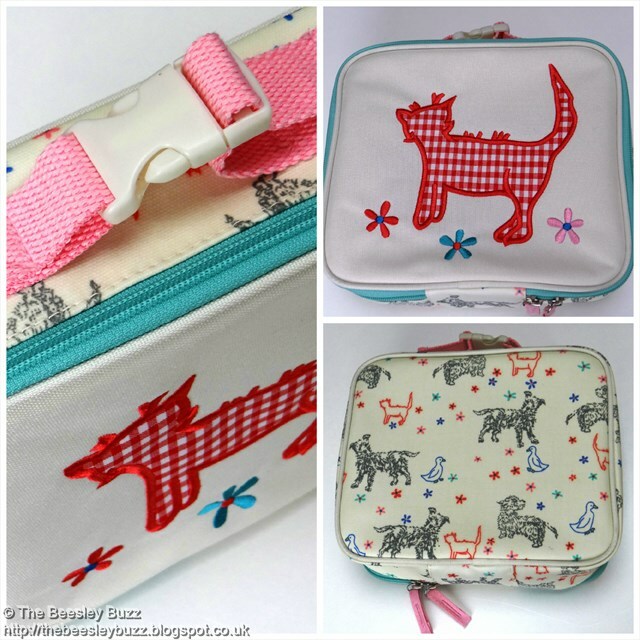 So all in all we think the Raining Cats and Dogs Lunchbox from Pink Lining is a wonderful practical beautiful gift for a child you know this Christmas! P.S. Have you got your Christmas Stocking yet? See our review for the stunning personalised Pink Lining Stocking here. 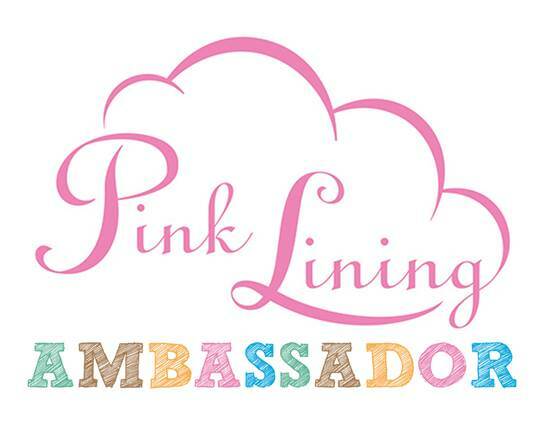 Disclosure: As Pink Lining Ambassadors we were sent the Pink Lining Raining Cats and Dogs lunchbox for review. All opinions are our own. 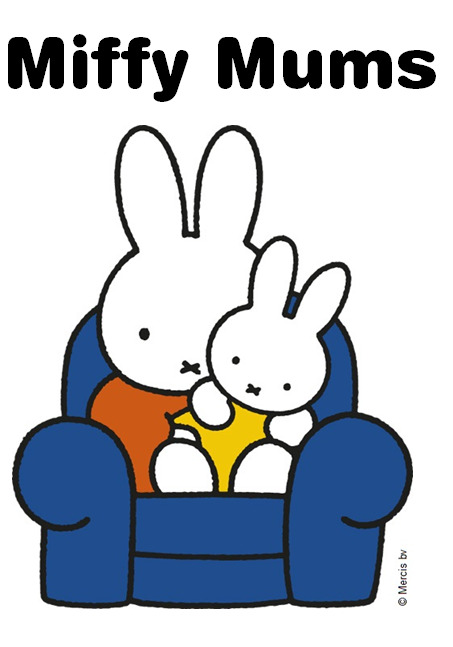 There's no doubt about it, things change when a baby comes along. I went from being someone who knew what I was doing, confident at work and at home to someone who felt thoroughly overwhelmed with the huge responsibility that looking after a new baby brings. Reading this rung so true! J was never a good sleeper and I struggled to feed him in the early days. We continue to have to make those judgement calls when it comes to health too - even though we now have 3 children, health still remains a tricky area to make decisions on. Whilst we relied heavily on our new group of friends (our amazing antenatal group who stuck together from pregnancy right through to our children's first day at school), it was often in the middle of the night that the health worries would creep up and that's when as a parent you really do have to learn to have the confidence to trust your instincts. For teething pain, fever and cold and flu symptoms we became familiar with those orange oral syringes in the Nurofen for Children packs. Nurofen for Children actually have a new product out specifically for Cold, Pain and Fever. And of course, the Nurofen for Children that we are now so familiar with is still available in orange and strawberry flavour and also available as handy sachets. But if we ever feel worried about our child and have that gut-feeling that there's something more to it, we will call either our GP or 111 for help and advice. As parents there are always going to be things that we worry about - I look back at the bathtime incident and laugh at myself and yet at the time it was something I really lacked confidence in. The same went for the weaning process, the sleep routine and the list goes on. But as time goes on, parenting confidence grows and there are people around to turn to when you do need that extra bit of help or advice whether it be your antenatal friends, the GP or health visitor or of course, Gran! 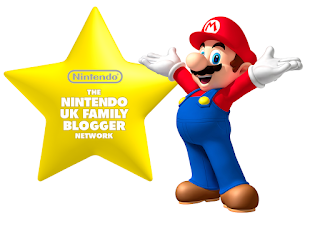 I am a member of the Mumsnet Bloggers Network Research Panel, a group of parent bloggers who have volunteered to blog about a specified subject or review products, services, events and brands for Mumsnet. I have editorial control and retain full editorial integrity. I have been entered into a prize draw to win a £100 voucher as a token of thanks for this post. Find out more about Mumsnet Bloggers here. And to see the other posts about this topic, see the linky here. Please note that this post is not intended to contain any medical advice. Always contact your own doctor or health professional if you have any concerns about your child's health. Adding to the gaming wishlist! There's no denying how incredibly lucky my kids are when it comes to gaming. Both the boys (and Daddy also) are HUGE gaming fans and love nothing better than to play on their gadgets and consoles for hours on end. Given the chance I think they'd all skip their meals, sleeptime and bathtimes to fit in more gaming time if they could. When we took a peek at some of our favourite games for Christmas, it made me realise just how lucky the kids have been to have already got to try out many of the games that are set to be favourites this Christmas. Since we wrote that post, they've also had Chibi-Robo: Zip Lash! for the Nintendo 3DS to review and we are currently putting Mario Tennis Ultra Smash and Animal Crossing: Amiibo Festival (both for the Nintendo Wii U) to the test with reviews to follow soon! For some reason unbeknown to me, D loves watching Adventure Time. Whenever I've caught any of it on TV, it seems full of odd characters and an even stranger storyline but D just can't get enough of it! 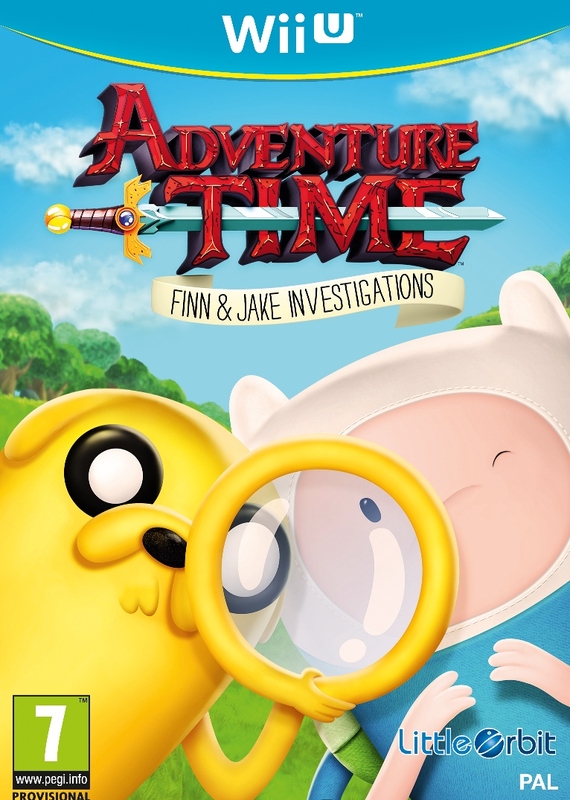 So his choice was Adventure Time: Finn & Jake Investigations (it's available for Nintendo Wii-U, Nintendo 3DS and also for Playstation 4 and Xbox one). 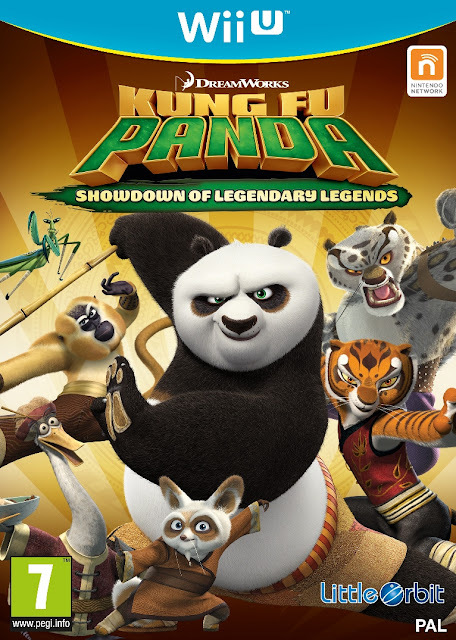 Kung-Fu Panda: Showdown of Legendary Legends is due for release soon and will be available for Nintendo Wii U, Nintendo 3DS as well as Xbox one and Playstation 4. There's no disclosure to write for this post as these are the games my kids chose from a selection that we were given information about - no payment has been received for this post and there was no obligation to write it. The information in italics has been provided to us so as always please check prices etc yourself at time of purchase. The Perfect Personalised Stocking from Pink Lining! This stunning Christmas stocking is available from Pink Lining. Priced at just £10 (without personalisation). You can add a personalised name (up to 11 characters) for £4.99 extra. All prices correct to the best of our knowledge. Please check yourself for current price at time of ordering. Chibi-Robo! Zip Lash is the fantastic new platform game for the Nintendo 3DS. You play as Chibi-Robo, a cute little robot, as he tries to save the world. Mischievous aliens have been stealing the world's resources, and it is up to Chibi-Robo to try to stop them. At only 10cm tall, he seems an unlikely hero but, armed with his Chibi-Plug and the skills to use it, he is more than capable. His two skills are the Whip Lash and the Zip Lash. In the first, he uses his Chibi-Plug as a whip to defeat enemies, a grappling hook to reach higher levels or a lasso to grab items. Once you gain the Zip Lash skill, though, you and Chibi-Robo can do so much more! Breaking bigger blocks, using the Chibi-Plug as a long-range zip wire, or defeating many enemies in a row at once, it really is a great addition to your armoury. This is a great game, loads of fun, and simple controls. With the Zip Lash power able to ricochet, you have to think about where you want to go and how you might get there. As with all the great Nintendo games, the first few levels are nice and simple so you can get used to the controls, and get progressively harder as you go. With over 35 levels spread across different continents, this will keep you entertained for hours. J, our resident gamer, has really got stuck in and proudly announced he has beaten the final boss this evening. There's still more to do to complete it, though - bonuses to unlock and an extra world - so he's still looking forward to playing it for many more hours. On Chibi-Robo! Zip Lash you are a robot called Chibi-Robo and you have to try to stop the aliens. You use your whip lash by pressing the X button and you press and hold the Y button to use a zip lash. You have to kill enemies and complete the levels. The final boss is awesome!!! You can buy an amiibo that can unlock a secret world. I want an amiibo for Christmas. I give it 10 out of 10!!! Chibi-Robo! Zip Lash is out now on Nintendo 3DS. Thank you Nintendo for sending us such a great game! A fine dining sandwich? Is it possible? - It is with #ProperPickle! The new Proper Pickle range from English Provender is exactly what it says on the jar - a truly proper pickle - crunchy, full of flavour and packs the perfect punch in a sandwich. The new range of Proper Pickles consists of 4 fabulous pickles: Proper Pickle Finely Chopped, Proper Pickle Chunky, Proper Pickle Pickled Onion and Proper Pickle Beetroot. All very tasty, all add a tang to a dish and they're ideal for making the perfect sandwich too! A sandwich is often a rushed 5 minute lunch grabbed between meetings without much thought going into it. Well I decided that a Proper Pickle deserves a proper sandwich. One with plenty of thought that's gone into it, made completely from scratch (yes - including the bread!) and worthy of enclosing the most proper of pickles. Presented with the finesse of the finest fine dining restaurant, this sandwich truly is worthy of a Proper Pickle. It looks and tastes amazing and it actually doesn't take too long to make either - just a little bit longer than a 'grab and go' boring sandwich. Truly worth those few extra minutes to make the bread and prepare the filling. The Finely Chopped Proper Pickle was the inspiration for my sandwich. It led me to think about whether a sandwich could be considered a fine dining experience given the right ingredients and presentation. The indian cooking cheese, Paneer, is used as my cheese in this sandwich (it is widely available from most supermarkets these days) and the home-made miniature roti breads provide the perfect bread backdrop to showcase the very best of what pickles have to offer...The Proper Pickle. This recipe makes enough for 2-3 people. Adjust quantities as required. 1. Make the cumin spiced roti bread by mixing together the flour and dry ingredients. Mix together the warm water and oil. Then pour the water into the dry ingredients and mix to form a dough. Knead for a couple of minutes until smooth. 2. Split the dough into 4 and roll each out. Brush with a little melted ghee, fold in half, brush with ghee again and fold in half again. Roll again to flatten it. Using a circle or square cutter, cut the dough then place in a dry frying pan on the hob for a minute or so on each side. Remove from pan. 3. Slice the Paneer into lengths and dry fry for a minute on each side until browned. Remove from heat and cut into small cubes. 4. Roll the cabbage leaf tightly removing any parts that are too hard to roll. Then slice as finely as you can. Place these in a dry frying pan and dry fry for a couple of minutes until they are slightly charred. Remove from heat. 5. Wash the coriander. Chop a few of the leaves. Keep those flavourful stalks and cut them into small pieces too - they are perfect as a garnish! Spoon a little Proper Pickle Finely Chopped onto one of your mini roti breads, place a fresh baby spinach leaf on top, then add the diced Paneer. Sprinkle a little chopped coriander on top of the Paneer and pop the second roti bread on top. Add a little of the charred red cabbage on the very top. Repeat to make 2 or 3 of these per person. Serve on a plate using the chopped coriander stalks as a garnish. For the perfect finishing touch, dot 3 pieces of Proper Pickle Beetroot around the plate too. And there you have it. It is possible to turn the humble sandwich into a fine dining experience with the right ingredients - and the right pickle in particular! This post is an entry into the #ProperPickle Challenge with The English Provender Co and Foodies100. Find out more here. These cute reindeer are so easy to make - I just made a batch of them for the preschool Christmas fete. Then I thought about how great they would be added to a Christmas card to make a unique edible gift! The recipe for the chocolate biscuit is a brilliant one from The Biscuiteers Book of Iced Biscuits recipe book and can also be found online here. The online recipe states 350g plain flour but we used 275g as per the version of this recipe that is found in the book. I used a Tom & Jerry cutter to get the shape but you can always make your own template using baking paper. 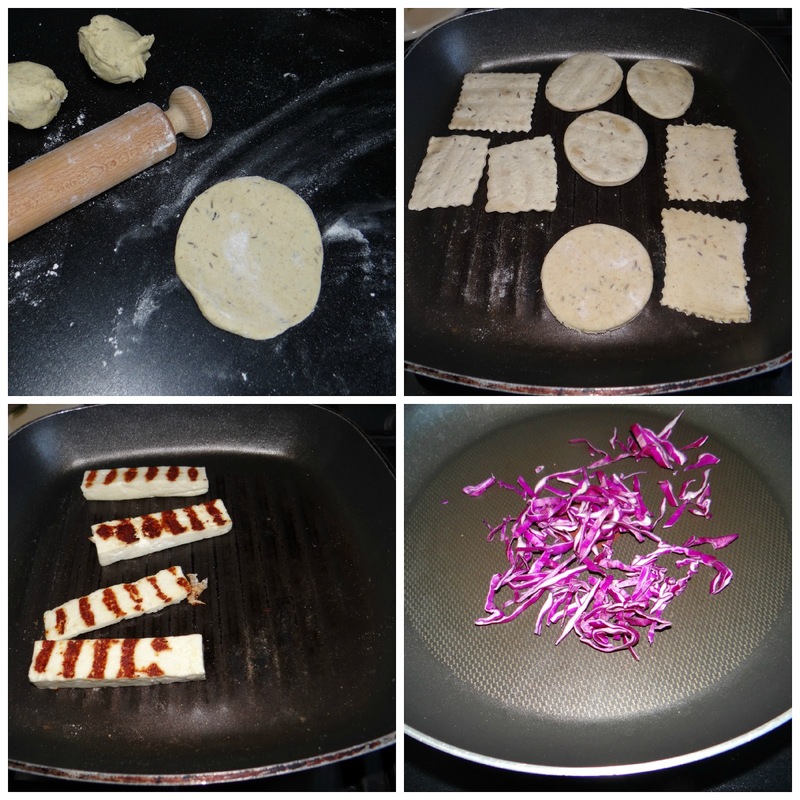 Draw the shape you want then use it to cut around the dough as a guide. The decorations were added using Icing made up using the powdered egg white version of the Royal Icing recipe found here. I made a much smaller quanity. The great thing about this design is that I only needed to make up one colour to use alongside white. I just added red sugarflair colouring to half the icing to make it red. I used squeezy bottles to pipe the icing on. The black dots in the eyes were done using a cocktail stick dipped into black food colouring paste and dotted onto the white part of the eye. A simple design but I think they look really festive in the run up to Christmas! When it comes to food, these days bright colours are often associated with E numbers and sugary kids sweets. Yet nature itself boasts many, completely natural, vibrant colours. We try to make sure nothing artificial sneaks into our meals by using plenty of fresh natural ingredients and cooking from scratch as much as possible. I wanted my #NothingArtificial Clover recipe to reflect all the wonderful colours that are found in food naturally. I also wanted to make a fun family recipe that's great all year round - warming jacket potatoes in the winter, that would make equally awesome picnic food on a summers day especially with the colourful rainbow salad we've made to go with the potatoes. Jacket potatoes and butter - a simply classic combination. By replacing butter with Clover as we've done here, you get all the buttery taste of butter as it's made with buttermilk but only half the saturated fat. Clover light goes a step further with 60% less saturated fat than butter meaning that you can use it in all your favourite recipes without the guilt. Packed full of tasty colourful veg and presented in a fun way, we hope our recipe will become a family favourite of yours too. Here's a recipe video we made to show what to do but for those who prefer it all written down, keep reading for the full ingredients list and method. 1. Preheat the oven to 180C. Wash your potatoes and pat dry. Push a few holes into each with a fork. Rub with a little sea salt (this helps get a crispier skin). Bake in the oven for 1 hour and 30 minutes. 2. Cook the broccoli, sweetcorn, beetroot and butternut squash. The broccoli and sweetcorn can be cooked on the hob for a few minutes in boiling water. The butternut squash and beetroot can be roasted for maximum flavour. This recipe can be made using leftover vegetables which makes it quicker. You can also use frozen butternut squash ready to roast in the oven for 30 minutes and pre-cooked beetroot to save time. 3. Once the vegetables are cooked mash each of them to a puree. You can use a stick blender to speed up this stage. 4. Cut each potato in half, and scoop out the potato into a bowl. Keep the skins. Add some grated cheese, seasoning, mixed herbs and the chosen vegetable puree and the most important ingredient - a dollop of Clover - and mix well. Scoop the mixture back into the skin. 5. Repeat this with all of the potatoes using a different vegetable puree for each. Grease a baking tray with a dot of Clover under where each potato will go. Then pop them back into the oven for around 15-20 minutes until they start to brown a little on top. 6. In the meantime prepare the rainbow salad. Wash and chop the ingredients and arrange on a plate to reflect all the colours of the rainbow. 7. Serve the potatoes with the rainbow salad remembering to add an extra dollop of Clover on top of your potato whilst it is warm. Clover has nothing artificial in it and nor does this delicious recipe. So here's our very own cowboy and magic fairy to make sure that all our mealtimes are protected from artificial ingredients. Truly good natural food at its best with #NothingArtificial involved! This post is my entry into the Tots100/Clover #NothingArtificial competition. More details about the competition can be found here and you can find out more about Clover here. I remember well the day that D rushed home from school and begged to join yet another online world. Along with all the other games he plays, I didn't really want him to. Then he showed me Animal Jam and when I saw that it is something that has been created in partnership with National Geographic Kids, an organisation I think of as educational and trustworthy, I changed my mind and let him join. And now, Animal Jam is available as a FREE app so we got it downloaded onto D's iPad to try out. 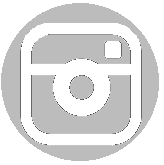 Can you give me an overview of what animal jam play wild app is about ? Well you get to create an animal so you can play games, move around Jamaa (which is the land it is set in) and make friends. You can choose from the animal choices which animal you want and then personalise it with the colour, pattern and accessories. By playing the different games on there you can earn lots of gems and then use them to buy more accessories and personalise your den. Tell me a bit about the land of Jamaa? It's big. You can go to lots of different places in it like the beach - crystal sands, the mountain - Mt Shiveer, and the forest - Sarepia forest. What games can you play on the app? There are lots of games to choose from. My favourites are falling phantoms, phantom dodger, and pill bugs where you get to blast the bugs to earn points which turn into gems. What do you think of the graphics? I think the characters are cute. Do you find it educational? Not really. It does show you different facts and animals and the world on the loading screens and at the end of each level on the games. Is it similar to the Animal Jam online game? Not really. On the online game you do missions, on the app it's mainly the games and making friends. Would you recommend this app to others? The Animal Jam Play Wild App is free to download. Animal Jam kindly sent us a goody bag as we were unable to make it to their recent bats event day. For a great write up of the day and some brilliant Bat facts, see this post at Vevivos. Nine year old D is our middle child. We joke about him suffering from 'middle child syndrome' - caught between an older brother with Aspergers and a younger sister with Juvenile Arthritis, D is extremely understanding, caring and just the best brother anyone could have. But he doesn't get as much attention from us as he deserves because of his older and younger siblings' needs. He has to fit in around J's timetable and Miss T's numerous hospital appointments. He tends to get hand-me-down clothes and toys from his big brother and rarely anything new of his own. So for this blogpost, I decided he would be the centre of attention. He could write his perfect Christmas wishlist to Santa. Everything he dreams of and I hope that Debenhams might be able to make his wish come true! He wrote this note to Santa and chose the following 5 favourite items from Debenhams. 1. LEGO Star Wars Imperial Troop Transport - 75078 - Perfect for a LEGO and Star Wars fan like D.
2. Despicable Me Travel Art Set - D loves to draw and this is perfect for car journeys to keep him busy and having fun. 3. Ravensburger Minions Bumper Puzzle Pack - D knows that Miss T is really getting into puzzles lately and she adores minions so D thought this would be amazing for them to do together. 4. Nerf Nerf-n-strike Elite rampage blaster - We already love Nerf guns in this family and D would love to get Nerf battling with his big brother and daddy too. 5. Crayola Design and Sketch 65 piece set - D can never get enough of new stationery and colouring items and his eyes just lit up when he saw this incredible set! What I love so much about Daniel is that he is always thinking of others and the choice of the Minions items was with his sister in mind as she is a massive Minions fan and he was thinking of how he could spend quality time with her. And as seems to have become a family tradition of ours he drew a picture for Santa too which we will leave out on Christmas eve. You can find out more about Debenhams Christmas Blogger Competition here. 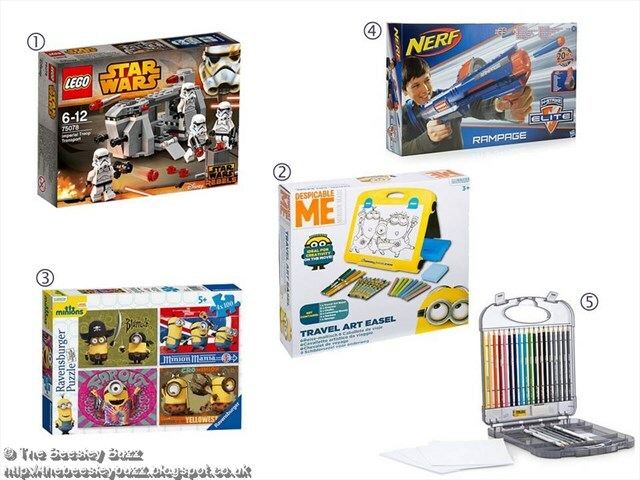 And you can see all the amazing toys for all ages of children on the Debenhams website. It's going to be a Nintendo Christmas!